Carnegie armed Napoleon with his personal letters of introduction to these rich and famous people. What followed was 20 years of interviewing successful men and women including Henry Ford, Thomas A Edison, John D Rockefeller, William Wrigley, William Taft, F W Woolworth, John Burroughs and Dr Alexander Graham Bell, but it was these interviews and their analyses that changed the way Napoleon looked at life. Both he and Carnegie referred to the interviews' results as the "Philosophy of Achievement", and both men were of the opinion that even the common man, if he knew what it was about personality that made men successful, could easily find success on his own strength, and by tweaking and fine-tuning his personality. In the year 1928, the critical information from the "Philosophy of Achievement" was distilled into an epic masterpiece entitled "The Law of Success". The book was a huge success. 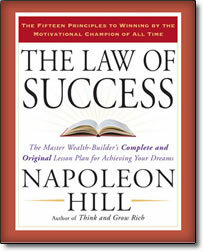 Napoleon Hill designed and created The Law of Success as a study program consisting of 16 lessons. It wasn't designed to just be read -- like a book. It was meant to be studied and acted on -- like a course -- a course in success. So why do we have it available HERE? Because in my view, many of the central tenets and teachings of this course are as relevant to project managers and leaders today as they were in 1928 when this was published. "In a short time each of you men will control the lives of a certain number of other men. ….When you join your organization you will find there a willing body of men who ask from you nothing more than the qualities that will command their respect, their loyalty and their obedience. They are perfectly ready and eager to follow you so long as you can convince them that you have these qualities. When the time comes that they are satisfied you do not possess them you might as well kiss yourself good-bye. Your usefulness in that organization is at an end. In a few days the great mass of you men will receive commissions as officers. These commissions will not make you leaders; they will merely make you officers. They will place you in a position where you can become leaders if you possess the proper attributes." "But you must make good, not so much with the men over you as with the men under you." I despair when I see Project Managers who focus all their efforts and communication towards senior management and the executives of a company, rather than working with their team to achieve the project objectives. Especially if they are brought into an established project team – an effective project manager spends more time with the team than with the "brass". These fundamentals of leadership are as relevant in today's business as they were in the 1920's when written. As far as I am concerned, Lesson Five should be essential reading for anyone wanting to become a Project Manager! The Law of Success course is basically a how-to manual of the skills and qualities required to become successful in whatever field one works. It is particularly relevant for those who achieve their success through the work of others. "The purpose of the Law of Success course is to enable you to find out how you may become more capable in your chosen field of work......You may not like the work in which you are now engaged. There are two ways of getting out of that work. One way is to take but little interest in what you are doing, aiming merely to do enough with which to "get by." Very soon you will find a way out, because the demand for your services will cease. It is your privilege to take your choice as to which way you will proceed." POWER- what it is and how to create and use it. CO-OPERATION - the psychology of co-operative effort and how to use it constructively. THE MASTER MIND - how it is created through harmony of purpose and effort, between two or more people. IMAGINATION - how to stimulate it so that it will create practical plans and new ideas. ORGANIZED EFFORT the source of all power. THERE'S A GOLD MINE in your present occupation if you will follow directions and dig for it. THERE'S PLENTY OF READY CAPITAL for development of any practical idea or plan you may create. Some reasons why people FAIL. WHY SOME PEOPLE antagonize others without knowing it. CHEMISTRY of the mind; how it will make or destroy you. WHAT is meant by the "psychological moment" in Salesmanship. THE MIND becomes devitalized-how to "recharge" it. THE VALUE and meaning of harmony in all cooperative effort. SUCCESS is a matter of tactful negotiation with other people. EVERY HUMAN BEING possesses at least two distinct personalities; one destructive and one constructive. TWO METHODS of gathering knowledge, through personal experience and by assimilating the knowledge gained through experience by others. To purchase, simply click the Buy Now button below. Also included in the Introductory Lesson is a Personal Analysis Chart the student is encouraged to complete after they have finished studying the whole course. As a point of comparison, Hill includes the chart rankings for 10 famous (and infamous) leaders in history. Lesson Two "is intended as a mind stimulant that will cause the student to organize and direct to a DEFINITE end the forces of his or her mind, thus harnessing the stupendous power which most people waste in spasmodic, purposeless thought. Singleness of purpose is essential for success, no matter what may be one's idea of the definition of success. Yet singleness of purpose is a quality which may, and generally does, call for thought on many allied subjects." According to Hill "The development of self-confidence starts with the elimination of this demon called fear, which sits upon a man's shoulder and whispers into his ear, "You can't do it - you are afraid to try - you are afraid of public opinion - you are afraid that you will fail – you are afraid you have not the ability." This fear demon is getting into close quarters. Science has found a deadly weapon with which to put it to flight, and this lesson on self-confidence has brought you this weapon for use in your battle with the world-old enemy of progress, fear." Hill explains the Law of Habit, and explains how our habits shape our personality. Hill states that cultivating a habit of saving will not limit what we earn, but allow us to conserve resources, and this will place us in the way of greater opportunities. This lesson will teach you how to distribute your income systematically so that a definite percentage of it will steadily accumulate, thus forming one of the greatest known sources of personal power. "This lesson, on Initiative and Leadership, follows the lesson on Self-confidence for the reason that no one could become an efficient leader or take the initiative in any great undertaking without belief in himself. Initiative and Leadership are associated terms in this lesson for the reason that Leadership is essential for the attainment of Success, and Initiative is the very foundation upon which this necessary quality of Leadership is built. Initiative is as essential to success as a hub is essential to a wagon wheel." Initiative is described as that rare quality that impels one to do what ought to be done without being told to do it. Leadership is not found among those who do not have initiative. In this lesson, Hill gives you procedures to follow to build your skills in initiative and leadership. Material achievements grow out of the organized plans that you create in your imagination. First comes the thought; then, organization of that thought into ideas and plans; then transformation of those plans into reality. The beginning is in your imagination. "ENTHUSIASM is a state of mind that inspires and arouses one to put action into the task at hand. It does more than this - it is contagious, and vitally affects not only the enthusiast, but all with whom he comes in contact". He also demonstrates how our state of mind influences others - not just their thoughts but their actions. The habit of doing more than paid for is linked to the Law of Increasing Returns, which will eventually ensure you a return in money, peace of mind and happiness far out of proportion to the service you render. Hill believes that it is personality that attracts others to us. People with a pleasing personality take a genuine interest in others, and speak forcefully and with conviction. He encourages us to make it our business to take a keen interest in other people and in their work, business or profession. He delves further into the Law of Auto-Suggestion and the Law of Habit, and shows us how to master our habits and set them to work for us. He also explains the Magic Key to Success - concentration leads to self-mastery. This lesson includes practical assignments to break bad habits and create new ones which will lead us to attaining our goals. "Before going to sleep at night impress upon your mind the desire to arise the next morning at a given hour, say at four A.M., and if your impression is accompanied by a positive determination to arise at that hour, your sub-conscious mind will register the impression and awaken you at precisely that time. Now the question might well be asked: "If I can impress my sub-conscious mind with the desire to arise at a specified time and it will awaken me at that time, why do I not form the habit of impressing it with other and more important desires?" According to Hill "neither temporary defeat nor adversity amounts to failure in the mind of the person who looks upon it as a teacher that will teach some needed lesson. As a matter of fact, there is a great and lasting lesson in every reverse, and in every defeat; and, usually, it is a lesson that could he learned in no other way than through defeat." The Golden Rule is the final lesson in this course, and perhaps the most profound. Whilst many of us have heard of the saying "do unto others as you would have them do unto you". In the Golden Rule, Hill takes this a step further, and encourages us to "think of others as you would have them think of you". Given how powerful our mind is, Hill reasonably argues that we should always look for the good in other people, and maintain positive thoughts at all times. "There can never be success without happiness, and no man can be happy without dispensing happiness to others. Moreover, the dispensation must be voluntary and with no other object in view than that of spreading sunshine into the hearts of those whose hearts are heavy-laden with burdens." This is simply a brilliant work written in a simple, practical way that everyone can understand. Although some of the examples can seem a little dated (it was written in 1928) the fundamental truths are still valid. If you are only going to buy one book about leadership or management skills, then I strongly suggest that you make it this one. It will change your life. This is the original Law of Success Course, updated and reformatted to make it more 21st century friendly. It is available as a set of 16 PDF files and you can download the course immediately upon payment through PayPal. The Manage That Project price for The Law of Success is only $29.95. There's no risk to you. When you buy The Law of Success, we are offering a 30 days, no questions asked, 100% money back guarantee. That's right - if you don't like it, don't keep it. Just send it back to us here at ManageThatProject (email to info@ManageThatProject.com) within 30 days, and we'll send you your money back.